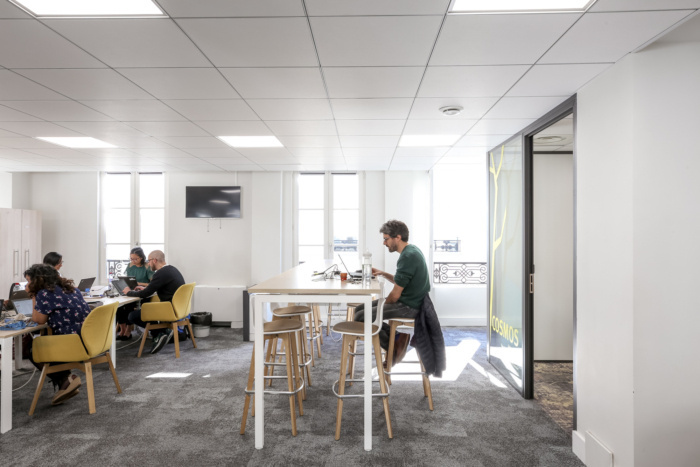 Artdesk Group was engaged by PeopleDoc, a cloud-based HR platform, to design their new offices located in Paris, France. Located in the 10th arrondissement of Paris, in the heart of the community of the creators, PeopleDoc settled in a private mansion which was completely restyle by Artdesk Group. The main idea was to create different spaces that encourage teamwork. PeopleDoc wanted unusual offices to work, find inspiration, focus, relax, organized to meet the different needs of their collaborators with resolutely designer offices. At the center of the main room, the wooden tree refers to the core business of PeopleDoc as they plant a tree everytime someone opens an online strongbox through the integrated HR Service Delivery Platform they launched in 2007. The new offices welcome the collaborators in an open environment made of wood with the main colors of PeopleDoc. This unique place proposes 10 spaces referring to 10 key activities in the workplace from the concept of Living Office by Herman Miller. The Plaza is the heart of the environment where collaborators find their inspiration. Haven is a small shelter where it is possible to focus on a precise work, also conceived as a place of relaxation. Hive encourages creation and collaborative work and The Jump Scale to work in task mode.